Samsung has unveiled what it is calling the world's first colour carbon nanotube active matrix electrophoretic display (coloured e-paper to you and me) at a recent conference in Korea. At 14.3 inches, it's a little large for holding on the train, but it heralds a new era of handheld newspapers and the like, with video support baked right in. Apparently it can also be used in mobile phone screens in the future, and improvements to the refresh rate will allow video to be viewed on later versions of the screen. If you're into e-paper (and who isn't these days, right?) all the advantages you know and love are still there, with minimal energy thanks to the constant image, visibility in direct sunlight and not a jot of backlighting. However, this means that full colour viewing is only possible when the light permits, which seems a bit limiting for something that could one day show video. 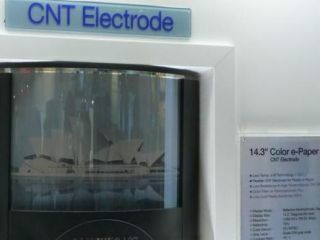 Samsung developed the screen in association with Unidym, which supplied the carbon nanotubes. Carbon nanotubes are approximately 1/50,000th of the width of a human hair, and are very, very good at conducting electricity among other things. This means displays based on this concept are very efficient, which is a big plus for today's battery hungry devices.